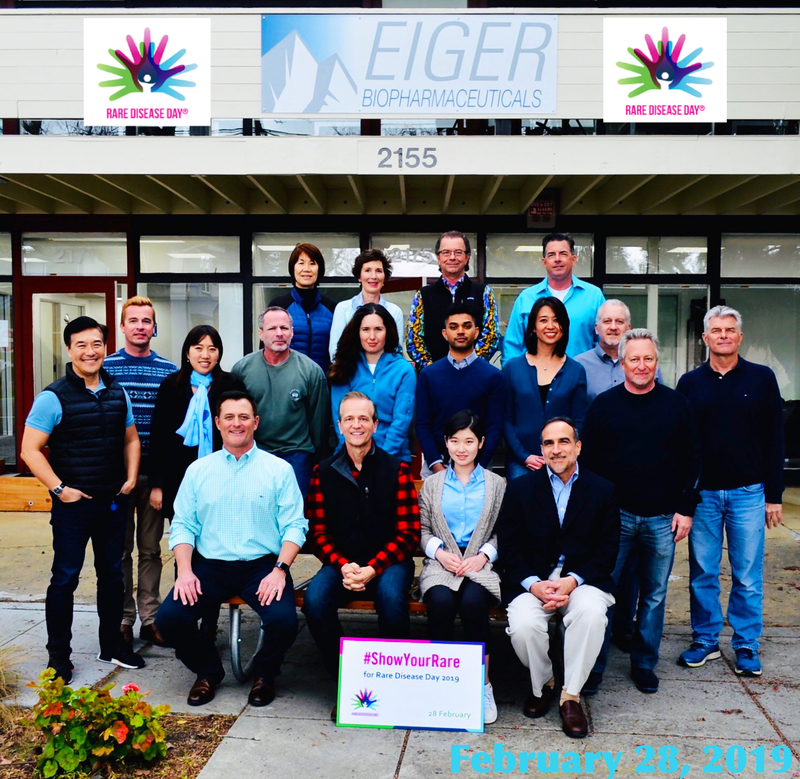 PALO ALTO, Calif., August 14, 2017 — Eiger BioPharmaceuticals, Inc. (Nasdaq:EIGR), focused on the development and commercialization of targeted therapies for rare diseases, announced today financial results for the three months and six months ended June 30, 2017 and provided a business update. 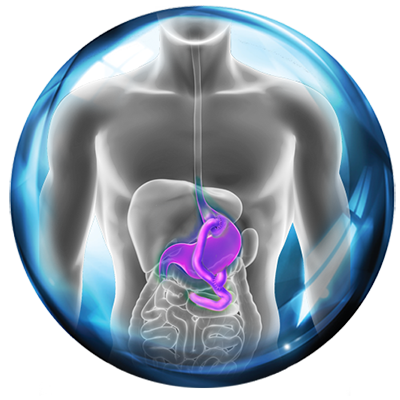 Successful monetization of non-strategic asset through sale of Mydicar® (rAAV1-SERCA2a) to Theragene Pharmaceuticals Inc.
Net loss for Q2 2017 was $11.1 million, or $1.33 per share basic and diluted, compared to a net loss of $13.2 million, or $1.87 per share basic and diluted for Q2 2016. Net losses were $22.4 million and $22.9 million for the six months ended June 30, 2017 and 2016, respectively, or $2.68 and $5.73 per share basic and diluted, respectively. Research and development expenses for Q2 2017 were $8.1 million compared to $10.7 million for Q2 2016, a decrease of $2.6 million. 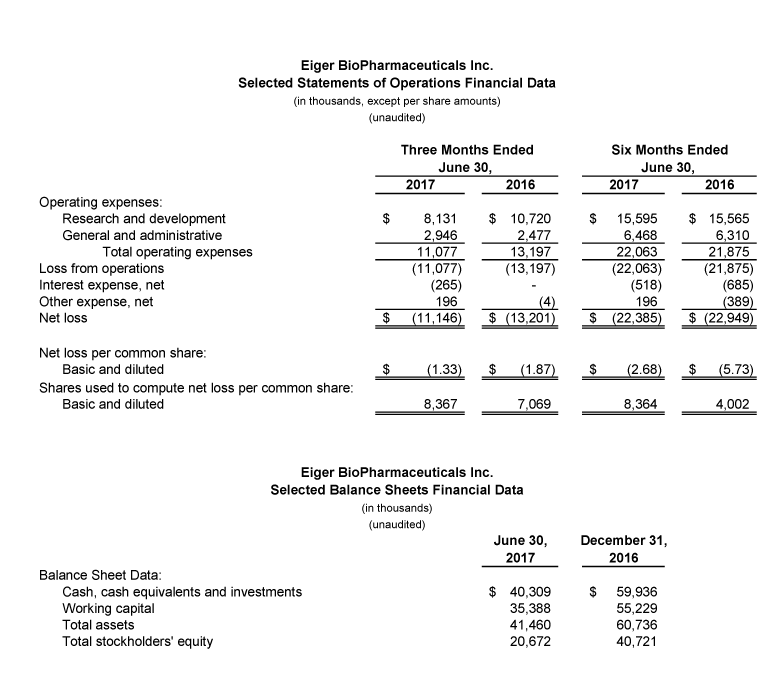 The decrease primarily relates to a $5.2 million upfront payment under Eiger’s license agreement with Bristol Myers Squibb Company that was recognized in Q2 2016. There were no similar payments during the same period in 2017. The decrease was partially offset by a $1.9 million increase in clinical expenditures due to increased program activity, a $0.5 million increase in compensation and personnel related expenses. R&D expenses were $15.6 million and $15.6 million for the six months ended June 30, 2017 and June 30, 2016, respectively. General and administrative expenses for Q2 2017 were $2.9 million compared to $2.5 million for Q2 2016, a $0.4 million increase. The increase was primarily due to a $0.6 million increase in stock-based compensation expense. The increase was partially offset by a $0.4 million decrease in legal, consulting, advisory and accounting services due to the incremental expenses incurred as a result of the merger with Celladon in Q1 2016. G&A expenses for the six months ended June 30, 2017 and June 30, 2016 were $6.5 million and $6.3 million, respectively. As of June 30, 2017, Eiger had cash, cash equivalents and short-term marketable securities of $40.3 million, compared to $59.9 million at December 31, 2016. This press release contains forward-looking statements that involve substantial risks and uncertainties. All statements, other than statements of historical facts, included in this press release regarding our strategy, future operations, future financial position, future revenue, projected expenses, prospects, plans and objectives, intentions, beliefs and expectations of management are forward-looking statements. These forward- looking statements may be accompanied by such words as “anticipate,” “believe,” “could,” “estimate,” “expect,” “forecast,” “intend,” “may,” “plan,” “potential,” “project,” “target,” “will” and other words and terms of similar meaning. Examples of such statements include, but are not limited to, our ability to timely and successfully achieve, all or any of the anticipated 2017 and 2018 milestones, whether or not pegylated interferon lambda or lonafarnib or ubenimex or exendin 9-39 may be further developed and approved, statements relating to the availability of cash for Eiger’s future operations and drug development portfolio, Eiger’s ability to develop its drug candidates for potential commercialization, the timing of the commencement and number and completion of Phase 2 trials and whether the products can be successfully developed or commercialized. 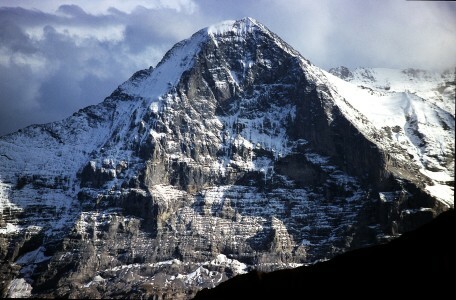 Various important factors could cause actual results or events to differ materially from the forward-looking statements that Eiger makes, including the risks described in the “Risk Factors” sections in the Annual Report on Form 10-Q for the three month period ended June 30, 2017 and Eiger’s periodic reports filed with the SEC. Eiger does not assume any obligation to update any forward-looking statements, except as required by law.